If you are looking to find Manchester offices to rent, then look no more, we have a wide variety of locations available to move into quickly. If you would like to discuss your needs in more detail, please use the simple contact form on the Left or call us directly, we are on hand to help people and businesses very efficiently, free of charge. Today the UK’s second city and the world’s original industrial city as well as the birthplace of the computer. Companies such as Google, The Co-Operative and the BBC have located in Manchester so you are in good company. Your business maybe a start-up business or it may already be already well established and this is swing space or a satellite office. Whatever your business status, type or industry, you have chosen to take serviced offices in Manchester due to the speed with which you can move into serviced offices and start doing what you’re best at, the all-inclusive nature of the costing, the fact that furniture is already in place and that you can upscale or downscale the amount of space you occupy in line with your requirements. Serviced offices have always been a popular choice for these reasons, as well as many others, and in fact they are becoming increasingly popular with the UK serviced office market growing by 19% between 2008 and 2011 and it continues to grow. 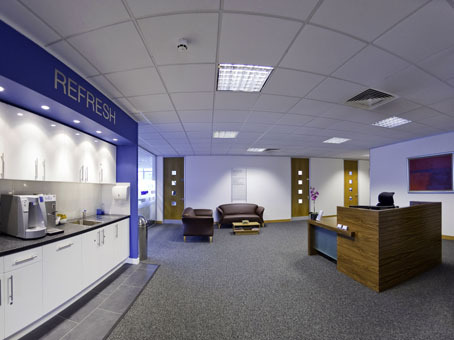 When choosing serviced offices in Manchester the exact location within the city is important. Does your business need to be located near Manchester airport because of the air links as many of your clients are international making is easier for them to visit you and vice versa, is your business within the aviation industry, do your workforce spend a lot of the time on the road and therefore you require close proximity to the M56 and the attached motorway network? If this is the case your business could be well suited to being located in a prestigious setting such as Cheadle Royal business park 5 minutes away from the airport. Maybe Salford Quays would be best suited to your business. It enjoys similar benefits to being near to the airport such as better car parking ratios than the city centre and the advantage that you don’t have to commute all the way into the city centre (while still only being 10 minutes away from it on the Metro). Maybe your business would benefit from being located close to the BBC and all of the businesses associated to it such as film production companies. There are of course many advantages of being located within the city centre with the great transport links being served by two major railway stations (Victoria and Piccadilly), the tram network and efficient road network. There are too many advantages to list of being located in this thriving city that was ranked as Europe’s top city for business competitiveness in 2010. If your business is best suited to being located within the city centre then there are many serviced office options to choose from in various areas within it. Your business may be within the creative industries and so may be suited to the Northern Quarter, it may require un-paralleled transport links and choose Piccadilly Place which is Grade A accommodation adjacent to Piccadilly train station, it may prefer the traditional central business district of King Street and its surrounding streets. Spinningfields, the 20-acre mixed-use scheme off Deansgate and home to many FTSE-100 companies maybe a more preferable option, or your business may prefer to locate in or near NOMA to the north of the city centre in close proximity to Victoria railway station. 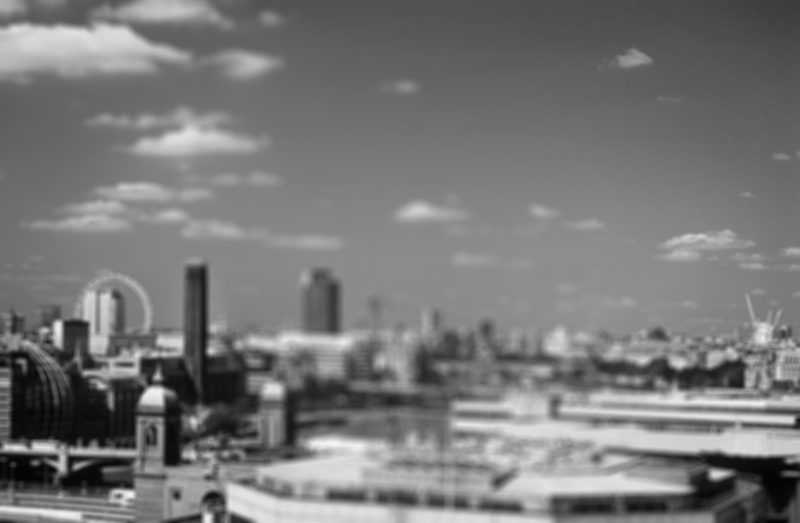 Whichever location is best suited and preferred for your new serviced office you will find it through us, we work with a wide variety of leading Serviced Office Agencies in Manchester and will provide you with the best deal. 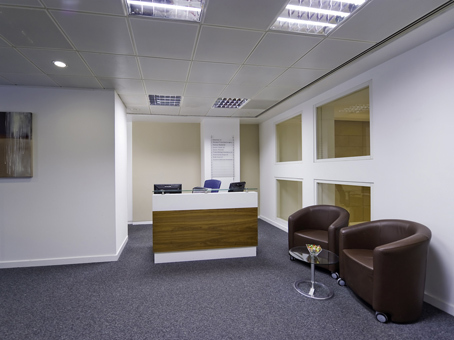 This prestigious office is located in the heart of Manchester’s traditional central district. The building was the originally the Bank of England and the heart of the North West’s financial and business community. Today the original banking hall is Grade 1 listed and forms the main reception hall of the office building. The offices are a modern 14-floor office tower which has been incorporated into the old banking hall forming an exquisite blend of old and new. The serviced offices here provide all modern conveniences such as air conditioning, raised floors, suspended ceilings and high speed lifts, as well as underground car parking. Situated in the heart of the city centre the offices are a close walk to bars and restaurants including Sam’s Chop House and Avalanche and enjoy easy access to excellent transport links. Spinningfields is a mixed-use 20 acre scheme developed by Allied London adjacent to Deansgate. It is a thriving district with many bars and restaurants including celebrity hangouts Neighbourhood and Australasia. Spinningfields is also home to many high-end retailers including Armani, Mulberry and Flannels. FTSE-100 office occupiers include Royal Bank of Scotland, HSBC and Guardian Media Group. Hardman Street was completed in 2009 and was, at 350,000 the largest speculative office development in Manchester’s history. Before the office was completed it was already 80% pre-let with tenants including Baker Tilly, Bank of New York Mellon, BDO Stoy Hayward and The General Medical Council. The impressive office building is a 16-storey tall tower boasting floor plates of up to 35,000 square feet. 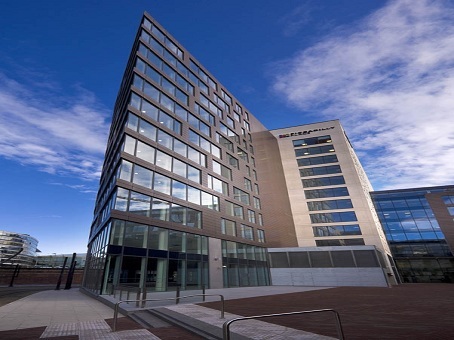 The building has been awarded a Building Research Establishment Environmental Assessment Methodology (BREEAM) rating of Excellent and provides efficient air-conditioning, excellent connectivity, intelligent glazing, showers, cycle storage and underground parking for 250 cars. Piccadilly Place is a mixed-use scheme located adjacent to Piccadilly Railway Station which is Manchester’s principal station and the UK’s sixth busiest serving approximately 20 million passengers annually. The scheme therefore has excellent national railway links as well as providing access to bus, taxi and tram links. The scheme is home to restaurants, cafes and hotels including Starbucks, Pita Pit and the DoubleTree by Hilton as well as being in close proximity to the amenities provided by the railway station such as WH Smiths, Sainsburys, Yo! Sushi and Carluccios. The serviced offices located over 11 floors are rated as BREEAM Excellent with all of the expected amenities such as air-conditioning, the latest cabling, high-speed internet and furniture included. Neighbouring tenants include Weightmans, the NHS and Barclays has recently committed to taking 80,000 square feet. Salford Quays was developed in 1982, it was the home of the Docks and was actually the UK’s first and largest urban regeneration project. The Quays are at the end of the Ship Canal providing peaceful waterside views and are just 10 minutes from the city centre by car or the city’s Metrolink system. Today Salford Quays is home to high-end residential schemes such as the NV Buildings, The Lowry theatre, The imperial War Museum, and its most recent addition, Media City which is home to the BBC as well as many associated media and digital companies. ITV completed the first phase of their move to Media City in 2013. Many prestigious companies occupy office space at Salford Quays including Sage Software, Bupa, and M&S Financial Services. The Digital World Centre provides air conditioning, full access raised floors providing access to Cat5 cabling, double glazed ‘floor to ceiling’ windows taking advantage of the impressive views, 24 hour security and ample parking. Manchester international airport with its 3 terminals is the third busiest in the UK and the 21st busiest in Europe and provides flights to over 200 destinations. Aside from the air links it enjoys excellent links by rail, bus and the adjoining motorway network. The airport and surrounding areas are home to many office occupiers, hotels and manufacturing and logistics companies. It was recently announced that Manchester airport will be home to the UK’s first ‘Airport City’ creating over 15,000 new jobs in the area. The 15 year development is a joint venture scheme which has received backing from the Beijing Construction Engineering Group reflecting the increasing importance of China as a major trading partner with Britain and the North West region. The Airport City will provide hotels and a mall as well as office space. Cheadle Royal Business Park is just five minutes away from Manchester Airport and provides a tranquil and impressively landscaped business park setting with lakes and wildlife. Within the park there is a David Lloyd gym, Travel Inn, extensive footpaths and jogging routes, and a crèche. The offices developed by MUSE developments provide modern office accommodation with air conditioning, raised floors, high-speed connectivity and excellent car parking provisions.